The Deputy Provincial Grand Master of the Province of Gloucestershire, VWBro John Campbell Thurston, presented WBro Bill Beedie of Innsworth Lodge (8751) with a 50 Years in Masonry pin at the Lodge’s Burns’ Night Meeting on 27 January. 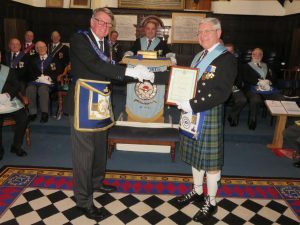 WBro Bill, who masterminds the Lodge’s Burns’ Nights and addresses the Haggis, was initiated into Montrose Kilwinning Lodge No 15 (Grand Lodge of Scotland), following his grandfather, father and two brothers into the Lodge. He was already serving in the Royal Air Force at this time and was only able to attend the lodge during periods of leave. For this reason, and because of the nomadic existence of a serviceman, his father purchased a lodge life membership for him. It was not possible for Bill to become established as a member of other Masonic lodges and, throughout the 1970s and the 1980s, his commitment to Freemasonry was limited to visiting; except between 1974 and 1977 when he was able to join the Star of Saxony Lodge No 853 (German Constitution) on the Roll of the Grand Lodge of British Freemasons in Germany. 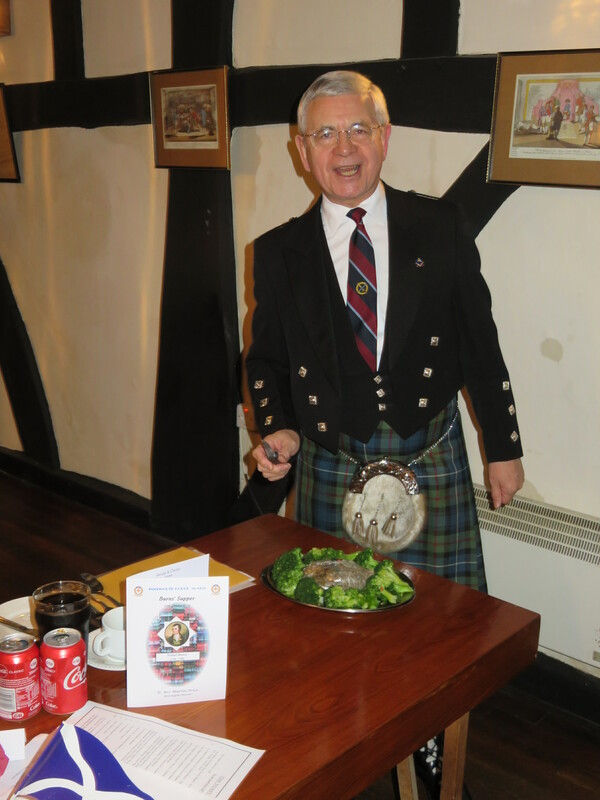 He joined Innsworth Lodge (8751) on 25 February 1995 and has been a member ever since. WBro Bill progressed to Innsworth Chapter in 1996 and is also a member of the Old Wycliffian Lodge, the Gloucestershire Provincial Grand Stewards’ Lodge and the Royal Order of Scotland. He served as Master of Innsworth Lodge 1999/2000 and is now Past Provincial Grand Superintendent of Works. In 1973/1974, whilst serving at RAF Saxa Vord on the island of Unst (the most northerly island in the Shetland chain) he was privileged to have been a regular visitor to the UK’s most northerly Masonic lodge (Lodge Aurora No 1654), and states that their 3rd Degree ceremony “had to be seen to be believed”.